Everyone loves a good walk. It’s one of those activities that transcends sport. You don’t have to be particularly fit and you can be of any age or weight to enjoy a stroll. However, sometimes we like to add another dimension to our walks, especially when the weather is favourable, we believe that nothing will soothe the soul like a quick plunge in open water before you head back to the car. These are some of our favourite walks with a wild swim thrown in to get the heart racing and the adrenaline pumping. Let us know what your favourite routes are around the country. This is a favourite of ours and a great little spot a stroll and a swim. The boomerang-shaped ribbon lake is a bit of an adventure hub. You’ll inevitably run into climbers, SUPers, fellow hikers and kayakers ambling around this spot. You have to hike through some private lands but walkers are allowed, just remember to leave no trace. It’s about a 4km hike down to the secluded beach. Don’t be put off by the brown hue of the water, wade in and unwind! The Barrow Way is a beautiful 120km long distance walk along the riverbanks of the Barrow. It follows surviving towpaths and riverside roads, from Lowtown in Co Kildare to the idyllic little village of St Mullins in Co Carlow. The peaceful route winds its way through the sylvan landscape following the river. Our favourite section is Graiguenamanagh to St Mullins. It’s 7km one way and there are umpteen spots along the bank that are perfect for a wild dip. Park up at the Raven Wood car park and explore the beautiful woodland walkway before emerging out onto the stunning white sandy beach of Curracloe for a swim. The waymarked walk is 7km long. The fields to the west are the North Slob lands, home to many important species of birds. If you are doing this walk during the winter months, you might spot all the geese from the North Slob flying out to roost on sandbanks in Wexford Harbour. The beautiful blue flag beach at Curracloe is definitely the highlight of this beach walk. The Bray to Greystones Cliff Walk is about seven kilometres long and brings you right around the outside of Bray Head. The walk is mostly flat with a few hills along the way. It is suitable for all abilities. You will arrive in the seaside village of Greystones. Here there are a number of cafes and restaurants should you want to refuel before your hike back along the same route. If you don’t want to walk back you can get the Dart from Greystones back to Bray. It will take about 3-4 hours there and back. Whichever direction you choose to go, there is a beach at either end waiting for you to take the plunge. Just type in Coumshingaun Lake into Instagram and the pictures alone will have you hopping in the car and heading straight there – all with the goal of nabbing yourself that epic picture of you perched on a rock overlooking the famous corrie lake. The hike to the lake is not waymarked so if your navigation skills are weak, we recommend hiring Mario from Muddy Boots. 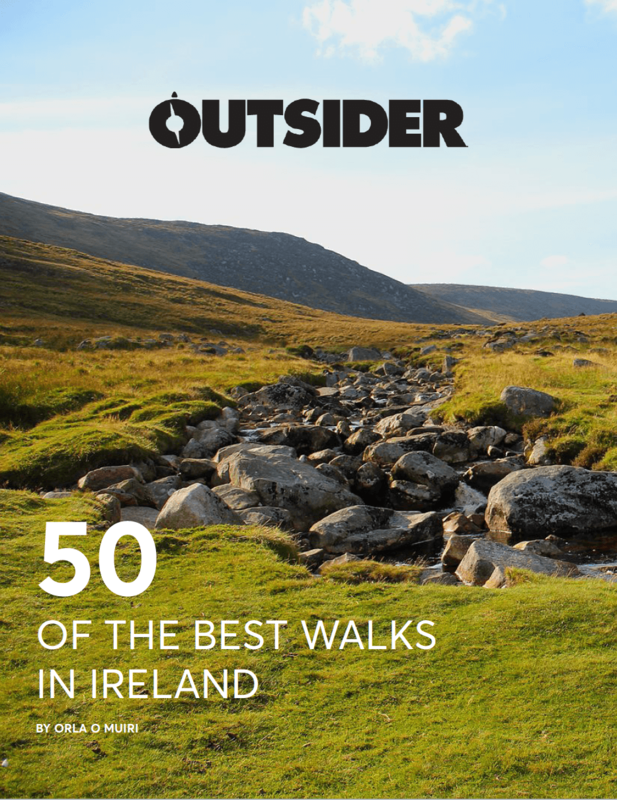 This guide’s stories of life in the Comeraghs and the hermit of Lackendarra will leave you spellbound. He’ll also introduce you to lots of edible plants as you walk. Getting up to the lake and back down takes about two hours. The highlight is definitely shedding your inhibitions and diving into the refreshing waters of this stunning lake. There are so many beautiful beaches to take a dip in along the Kerry coastline including Ballybunion, Inch and Derrynane. For something a little more adventurous though, up near the top of Dingle’s Conor pass, you’ll find an idyllic little lake called Peddlers Lake. It’s a bit of a climb up to reach it and the water will be chilly… but wow, what a view. There is nothing quite like swimming in the mountains. With is quaint wooden jetties jutting into the water, this is the perfect place to watch the sunrise. And of course, what’s a perfect sunrise without submerging yourself into the water for a refreshing dip too?! The jetties are relatively hidden but not hard to find. Simply park your car Ballycuggaran Beach at Two Mile Gate and follow the small dirt part on the right-hand side of the car park through the trees until you reach the water. You can’t miss them! There is a large sign in the car park with all the options for loop walks from here so head off first and finish up with a wade in the water. If you are looking for a remote swim in the wild, Lough Ouler is perfect. It’s a corrie lake at the base of Tonelagee Mountain. Cool off post-hike in Ireland’s heart-shaped lake. It’ll take just under an hour to trek to, but that’s all part of the adventure. The water is dark but fresh. It’s not well used as a swim spot because of its location but it is a well-worn walking trail so odds are you won’t be alone, you may, in fact, inspire some sweaty hill walkers to take a dip as well! Tucked away, completely out of sight, Annagh Bay has to be one of the most breath-taking sea swimming spots in Ireland. Sitting adjacent to Ireland’s lowest corrie, with its white sand and turquoise waters there are few places on the planet more inviting! The bay can only be accessed via foot – it’s about a 1.5hour hike over the hill to get there! But with stunning views throughout, the hike in only makes the entire experience more special. The Pollock holes, Diamond Rocks, and Intrinsic Bay are just some of the delightful hotspots you’ll encounter on the Kilkee cliff walk. It starts at the Diamond Rocks Café at the West End of the town of Kilkee. With no walls between the walkway and the cliff’s edge, you’ll get your daily dose of adrenaline just by walking. Away from the crowds, Co Clare’s Kilkee cliff walk is a delight waiting to be discovered. When the tide is out, three Pollock holes at the west end of Kilkee are unveiled and they are well worth seeking out for a dip. This area is the perfect place for your water adventures with diving boards just outside the town and people doing sub-aqua in the clear waters off the rocks.